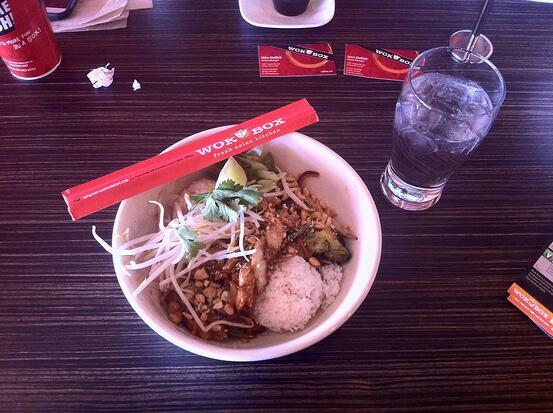 WOK BOX. With a creative name like that, you know you are in for something unique. 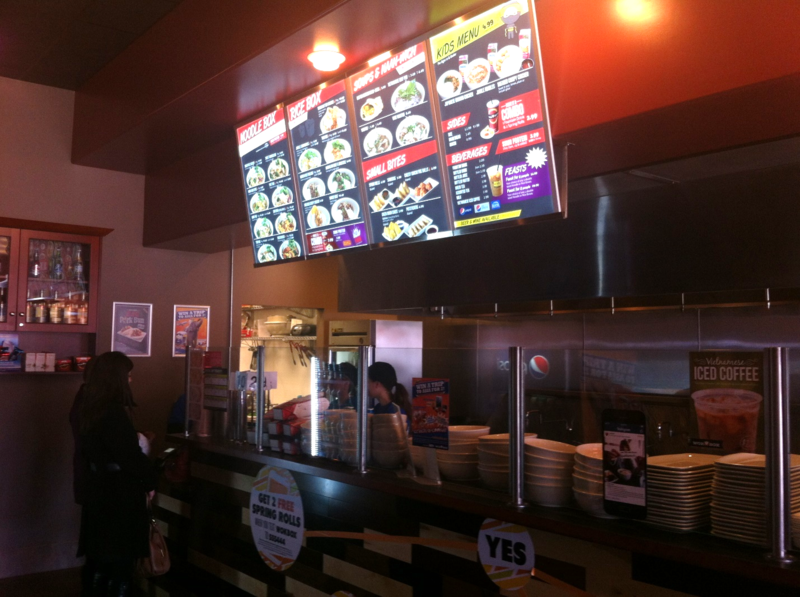 This fast food restaurant is self-described as a ‘Fresh Asian Kitchen’. 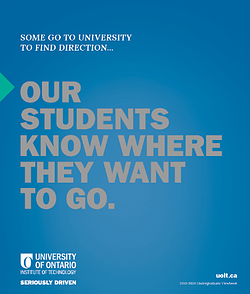 The franchise is a small one, with Oshawa boasting one of only three locations in Ontario (the other two are in London). It was founded as a single store in Edmonton, Alberta in 2004 and now operates out of 60 locations across Canada and the United States. 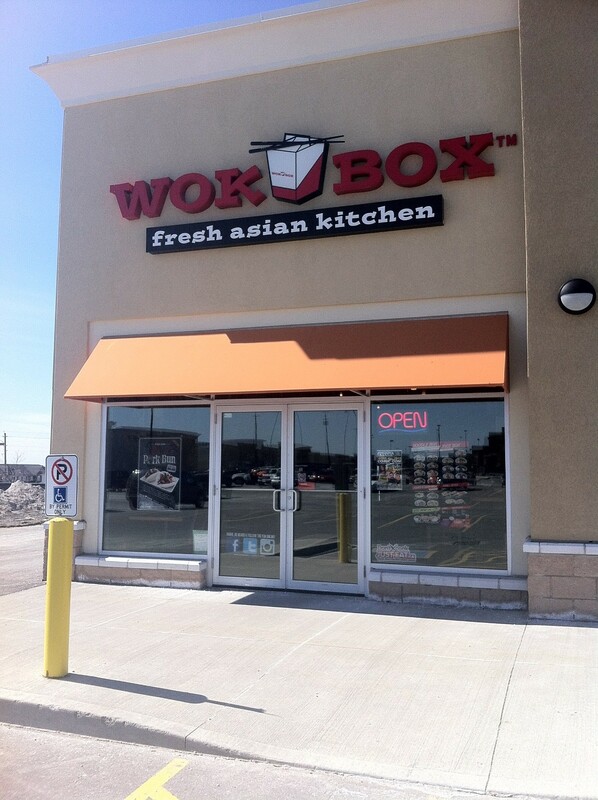 WOK BOX Oshawa opened last year in the plaza at the southeast corner of Harmony and Taunton (about 15 minutes away from UOIT's north Oshawa location on the 916 Rossland bus route). But enough with the pleasantries – let’s get to the food. Walking into the restaurant, you are instantly aware of dimmed lights, several HDTVs and various types of seating. Think sports bar meets Asian walk-in restaurant. Pick your style: noodle box or rice box. Pick your sauce: Mongolian, Kung Pao, Pad Thai, etc. Pick your meat: chicken, beef, tofu, shrimp or extra veggie. Pick your noodle: chow mein, hokkien, ribbon or udon (or rice). In addition to what has been already mentioned, the menu also includes various soups and sandwiches, as well as a kid’s menu. Prices are very reasonable for a restaurant of this type, with most menu items allowing either a large or small (regular or lunch) size portion. Meals can be ordered either as walk-in or take-out. As a note to local students: delivery is also available. 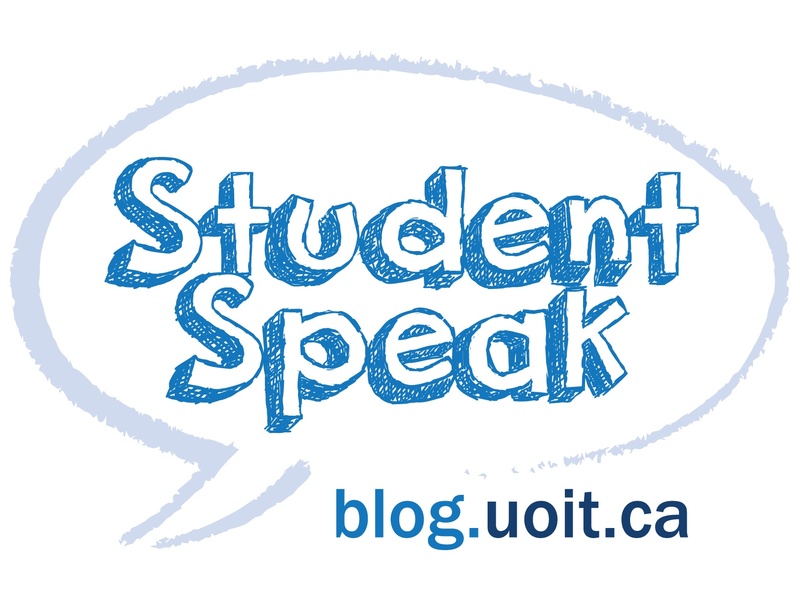 This is good news for those long days of exam studying coming up. And yes, they do deliver to our residence buildings. It’s also worth mentioning that there is helpful signage posted regarding allergy information, as well as what menu items cater to various dietary requirements (e.g. gluten-free, vegetarian and vegan). I ordered a regular Singapore Cashew noodle box with chicken, Sriracha peanut sauce, rice and veggies (carrots, bok choy, napa cabbage, broccoli, onions, and peppers). The meal also came with bean sprouts, lime, cilantro and green onions as a garnish. These not only looked nice, but genuinely improved the taste of the meal. After being given a number, we were invited to take our seats. Meals came within 5 minutes. Now, I have to be honest and say that I’m no restaurant connoisseur – in fact, my wife regularly has to remind me to slow down and enjoy my food rather than shoveling it down as if it’s going out of style. But I can genuinely say that this meal was excellent. The vegetables were fresh and crisp, the chicken had excellent flavor and like I said, the garnish added a welcome twist to the taste. We were enjoying our food so much that the conversation literally stopped. That’s always a good sign when eating. When we were finishing our meals, the owner came by our table to offer us fortune cookies (regular or strawberry flavored!). But these cookies were not your norm – no sappy predictions on the future successes of our love lives here. Instead, there are opportunities to win prizes up for grabs. I’m happy to say that I won a free drink. After my constantly humiliating experiences with Roll Up the Rim (0/18…), this was a welcome change. Last thing to mention: these guys are totally plugged in with technology. They have stickers encouraging customers to follow them on Instagram, opportunities to get free spring rolls if you text their number and draws for a trip to Asia if you go online. 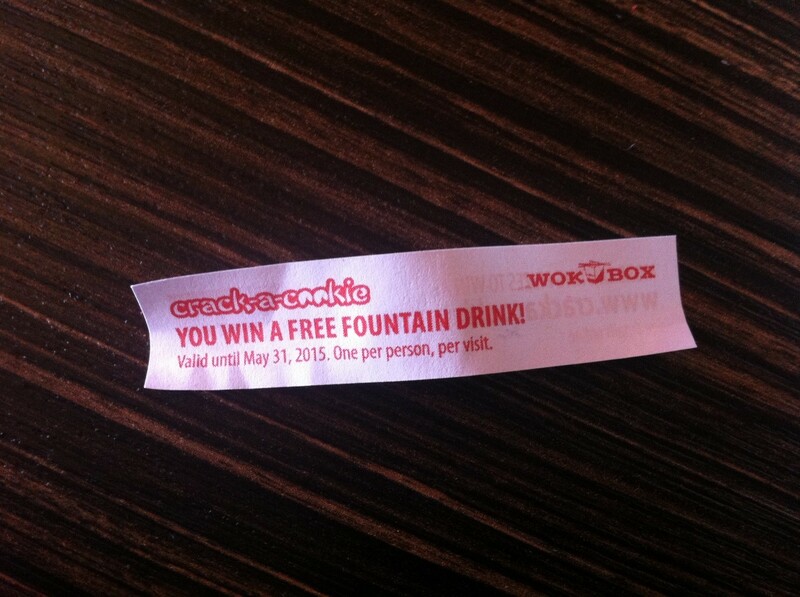 TL;DR: go to WOK BOX. Inexpensive, freshly made, delicious and quick Asian cuisine.